The number of homicides - including murder and manslaughter - rose from 649 to 739, an increase of 14%, in the 12 months to the end of September 2018. It is the the highest total for such crimes since 2007. Robbery went up by 17%, as did recorded sexual offences, according to the data released by the Office for National Statistics (ONS). Overall crimes recorded by police went up by 7% with a total of 5,723,182 offences recorded. John Apter, chairman of the Police Federation, which represents thousands of lower rank officers across England and Wales, said: "Society just isn't as safe as it once was, and although the police service is doing everything within its power, we are swimming against the tide and it is the public who are being let down." Public order offences went up by 24% to 427,134. In this case, while the ONS said changes in recording practices might have had an impact, there could also be a "genuine" increase. Alex Mayes, policy and public affairs adviser at charity Victim Support, said of the violent crime statistics: "These figures starkly highlight the devastating human cost of the recent rises in serious violence that we've seen across the country. "Working with bereaved families through our national homicide service we know just how destructive these shocking crimes are." Policing Minister Nick Hurd said overall the chance of being a victim of crime remains low, but added: "We accept certain crimes, particularly violent crime, have increased and we are doing everything possible to reverse the trend." He said those moves included a proposed increase in police funding, and a strategy to prevent young people turning to crime. Prime Minister Theresa May's official spokesman said: "These statistics show that your chance of being a victim of crime remains low, but we recognise that certain crimes - particularly violent crime - have increased, and we are taking action to address this." Labour shadow home secretary Diane Abbott said the data "underlines the failures of government policy". She said: "Serious violent crime continues to rise yet the government remains in denial about the effects of its own policies. The Tories have cut police officer numbers. "They have also exacerbated all the causes of crime, including inequality, poverty, poor mental health care as well the crisis in our schools, especially school exclusions. "Labour is committed to increasing police numbers and to reversing the austerity policies which are contributing to crime." On homicide, statisticians said the increase continues an upward trend that has been seen since March 2014, indicating a change to the long-term decrease over the previous decade. The homicide figures exclude victims of terrorism attacks in England and Wales. A lot of these crimes, which the ONS describes as "lower-volume, higher-harm types of violence", happened in London and other major cities. Chief Constable Bill Skelly, of the National Police Chiefs' Council, said some increases could be due to changes in how police record crime, and increasing reporting of incidents, there are "real rises in serious crimes like robbery and violence with weapons, with a devastating impact on victims and families". Police forces are committed to tackling violent crime and those having offensive weapons, but need to work alongside other organisations like the Home Office "because this is not something that can be solved by policing alone," he said. "Rising crime, increased terrorist activity and fewer police officers have put serious strain on the policing we offer to the public," he added. The Home Office statistics are published at the same time as the Crime Survey for England and Wales, which is based on people's experiences of crime. The survey includes crimes that people do not report to police. The only main crime type that showed a change in the 12-month period, according to the survey, was computer misuse - including crimes involving scams and computer viruses - which went down by 33%. "There are variations within this overall figure, depending on the type of crime. Burglary, shoplifting and computer misuse are decreasing but others, such as vehicle offences and robbery, are rising. 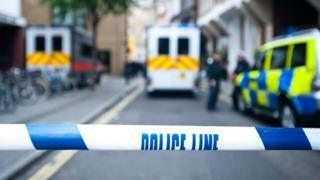 BBC home affairs correspondent Danny Shaw said the figures painted a "pretty bleak picture" and there were a number of possible reasons for the increase in violent crime. "The Home Office has said that it's linked to the drugs market and the fact that cocaine, in particular, is now more readily available in this country," he said. "The price of it has come down, the purity has gone up, and that is increasing the tension between drug gangs, which spills across to the streets. "We're also seeing in these homicide statistics that there have been more domestic killings. "That obviously isn't explained by the drugs market but there could be other factors - social factors, could it be to do with the fact there's been a decrease in the number of police officers in the past seven or eight years? "These are some of the theories being put out there, but there's no simple explanation."